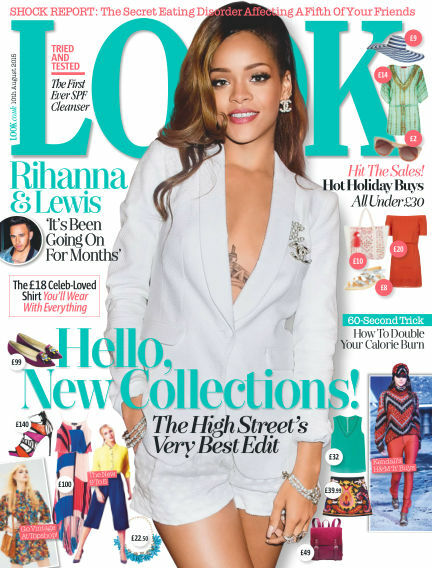 In this issue of Look : Look is the glamorous, glossy high-street fashion weekly. The UK's biggest selling fashion magazine, Look's unique mix of authoritative and accessible shopping advice, beauty tips, celebrity news and real-life features makes it a must-read for every trend-conscious woman. Look's positive, inclusive ethos extends throughout the brand, from the uplifting tone of its news stories through to the use of realistically sized models in every issue. Look's website was successfully relaunched in January 2010. As well as bringing its 404,000 (and counting) unique users a daily fix of the very latest trends, beauty news and celebrity style, look.co.uk is also the savvy fashion shopper's one-stop shop, where users can browse and buy in excess of 127,000 products from over 2,500 brands spanning the entire high street. With Readly you can read Look (issue 10th August 2015) and thousands of other magazines on your tablet and smartphone. Get access to all with just one subscription. New releases and back issues – all included.